A BUBBLING CAULDRON: No Costa Mesa Traffic Related Deaths in 2012! Late Wednesday afternoon the Costa Mesa Police Department issued a press release which informed us that Costa Mesa had NO traffic related deaths on city roadways during 2012. According to the information provided, traffic related deaths are on the rise across the nation, which makes this accomplishment by the drivers in this city and those who enforce our traffic laws that much more noteworthy. The release says, in part, "Overall, the Police Department credits the community for safer driving practices." It also attributes this accomplishment to "education, deterrence, and directed enforcement by the Police Department's Traffic Safety Bureau." 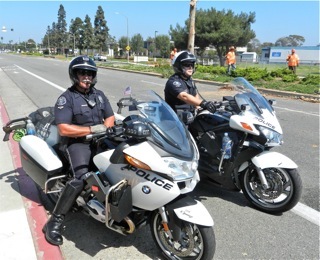 Credit is also given to Costa Mesa's partnership with the California Office of Traffic Safety which provided what is described as "instrumental resources in the ongoing efforts to improve roadway safety. With over 1 million vehicles traveling city thoroughfares on a daily basis, efficent use of resources, coupled with state grant funding have provided an effective approach." This information is made even more relevant when you consider that the CMPD has been operating in a severly under-manned mode for the past several years. In addition to the authorized strength of sworn officers being only 131, down from a high of 164 only a couple years ago, in actuality the CMPD is working with many fewer officers on the street than that due to injuries and retirements. It's our understanding that Chief Tom Gazsi is working on plans to improve that situation as quickly as possible. Thanks to the good folks of the CMPD for doing their best to keep us safe. And thanks to my fellow residents for doing your part by driving safer. Keep it up! Fantastic news. Not quite sure what to attribute it to, but its great to hear. Fewer bars in business? Too much traffic to get up any speed? Don't know. But hey...a great high mark. Part of an overall nationwide trend. Traffic deaths are at a 62 year low. Due to a number of factors, but very happy to see our town post a big fat zero. The Costa Mesa brand is strong ! How did HB do? They have a much larger area to cover than CM and only have 1 more cop on patrol than us. Yeah, but... How we ever gonna beat this year's record? ?